I would like to introduce Caryl Matrisciana. A former occultist and an expert on spiritual warfare. She grew up in India, where she learned the ways of the occult. She moved to Great Britain and along the way was touched by the spirit of God and converted to Christianity. She spends her time now in research, writing and in making films about the lessons she has learned. Spiritual Warfare is a topic that the bible spends a lot of time on, but today’s churches spend so very little. If its even ever mentioned at all. It has always been important and during this final age that we are living in it should be learned and developed by each of us in order to thrive and defeat the enemy. I believe God’s hand of protection has been taken off this once great nation. We enjoyed that covering for over 200 hundred years. As His protection has been lifted, the demonic has been given more freedom to operate. But don’t think for a minute that God is causing this to happen. His spirit of protection has been removed because of our sin and rebellion. In other words “We the people” have pushed God’s protective shield away and now we are getting what we deserve. And Christians are his biggest target. Let’s learn how to take charge of the world around us. 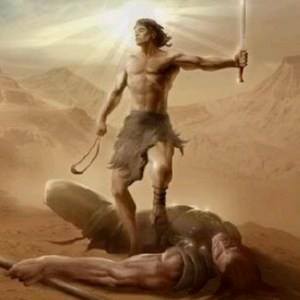 Here is a video presentation on spiritual warfare by Caryl. By being born again and living with An Enduring Faith — we will overcome. That is a promise of God. God gives us the strength. John 14:17 the Spirit of Truth, whom the world cannot receive because it does not see Him nor know Him. But you know Him, for He dwells with you and shall be in you. We must learn to discern the spirits. Another teaching by Caryl. But not by our own strength. By the strength and power of He who is at the center of An Enduring Faith. Our Lord and God-Jesus Christ. Let Jesus be your teacher. A quick summary look at the Gospel of Mark, it is a good place to start, to understand how great is the need for spiritual warfare and deliverance. Mark 1:23-27 And there was in their synagogue a man with an unclean spirit; and he cried out, Saying, Let us alone; what have we to do with thee, thou Jesus of Nazareth? art thou come to destroy us? I know thee who thou art, the Holy One of God. And Jesus rebuked him, saying, Hold thy peace, and come out of him. And when the unclean spirit had torn him, and cried with a loud voice, he came out of him. And they were all amazed, insomuch that they questioned among themselves, saying, What thing is this? what new doctrine is this? for with authority commandeth he even the unclean spirits, and they do obey him. Mark 3:22-30 And the scribes which came down from Jerusalem said, He hath Beelzebub, and by the prince of the devils casteth he out devils. And he called them unto him, and said unto them in parables, How can Satan cast out Satan? And if a kingdom be divided against itself, that kingdom cannot stand. And if a house be divided against itself, that house cannot stand. And if Satan rise up against himself, and be divided, he cannot stand, but hath an end. No man can enter into a strong man’s house, and spoil his goods, except he will first bind the strong man; and then he will spoil his house. Verily I say unto you, All sins shall be forgiven unto the sons of men, and blasphemies wherewith soever they shall blaspheme: But he that shall blaspheme against the Holy Ghost hath never forgiveness, but is in danger of eternal damnation: Because they said, He hath an unclean spirit. Mark 4:40-41 And He said unto them, Why are ye so fearful? how is it that ye have no faith? And they feared exceedingly, and said one to another, What manner of man is this, that even the wind and the sea obey Him? Mark 7:25-30 For a certain woman, whose young daughter had an unclean spirit, heard of him, and came and fell at his feet: The woman was a Greek, a Syrophenician by nation; and she besought him that he would cast forth the devil out of her daughter. But Jesus said unto her, Let the children first be filled: for it is not meet to take the children’s bread, and to cast it unto the dogs. And she answered and said unto him, Yes, Lord: yet the dogs under the table eat of the children’s crumbs. And he said unto her, For this saying go thy way; the devil is gone out of thy daughter. And when she was come to her house, she found the devil gone out, and her daughter laid upon the bed. Mark 8:32-33 And He spake that saying openly. And Peter took Him, and began to rebuke Him. But when He had turned about and looked on His disciples, He rebuked Peter, saying, Get thee behind Me, Satan: for thou savourest not the things that be of God, but the things that be of men. Mark 11:24-26 Therefore I say unto you, What things soever ye desire, when ye pray, believe that ye receive them, and ye shall have them. And when ye stand praying, forgive, if ye have ought against any: that your Father also which is in heaven may forgive you your trespasses. But if ye do not forgive, neither will your Father which is in heaven forgive your trespasses. Mark 16:16-18 He that believeth and is baptized shall be saved; but he that believeth not shall be damned. And these signs shall follow them that believe; In My name shall they cast out devils; they shall speak with new tongues; They shall take up serpents; and if they drink any deadly thing, it shall not hurt them; they shall lay hands on the sick, and they shall recover. It is sad that most in church dumb today, have been taught that BORN AGAIN, Holy Spirit Baptized believers, are exempt from demons in their flesh and mind. THE TRUTH IS THAT CHRISTIANS ARE THE HIGH PRIORITY TARGETS FOR THE DEMONS. Our faith is measured by how much we put our beliefs into action. We have an entire category of teachings on spiritual warfare and deliverance. Check it out. You can go to this link or it is in the category section at the upper right of this page. In addition to the writings and postings on The Joseph Plan I have authored a new ebook, entitled the Biblical Spiritual Warfare Manual.It is almost 200 pages of teachings that you can dowload and have on your personal pc or notebook. It comes with an ebook reader. Perfect for all, because we will need this type of solid information and biblical teachings when the roof caves in and we loose the internet. Thank You, Father. Bless your vessels. Hi, The video is working fine. I suggest that you check with your isp. You can check your own system by trying to watch a You Tube video. If you can your personal system is working fine. Then it has to be the isp. I got the advise download. It turned into a good thing. I and my sister have been both having sleep problem. Thank-you for good talk on the Lords word. We both needed and are gratefull. Bless all of you.